One of our favorite sourdough starter cultures, Desem Sourdough Starter is a Flemish-style sourdough starter made with organic whole wheat flour. It makes delicious whole grain bread. Each box contains 1 packet of dehydrated Desem Sourdough Starter Culture. One packet is all you need. With simple care, the sourdough starter can be used repeatedly to make baked goods. 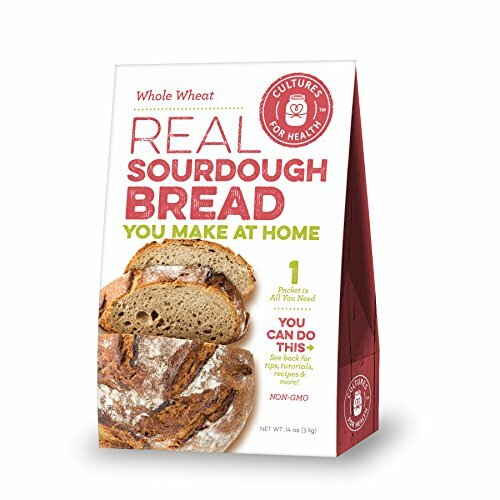 Store the sourdough culture in a cool, dry place until ready to activate using whole wheat flour and water. Easy to use and maintain. Complete instructions for care and maintenance of the sourdough bread starter are included in every box. Ingredients: Organic whole wheat flour, live active cultures. Non-GMO. Dried sourdough starter cultures can be ready to create baked goods within 3-5 days. Allergen information: Manufactured in a facility that produces products made with gluten and dairy. Actual product packaging may differ from image shown above. If you have any questions about this product by Cultures For Health, contact us by completing and submitting the form below. If you are looking for a specif part number, please include it with your message. Dulcet Happy Birthday Gift Basket- Includes Traditional and Raspberry Crumb Cake, Mini Muffins,Chocolate Chip Cookies, Assorted From Our Best Rugelach, Birthday Candles and Birthday Balloons!